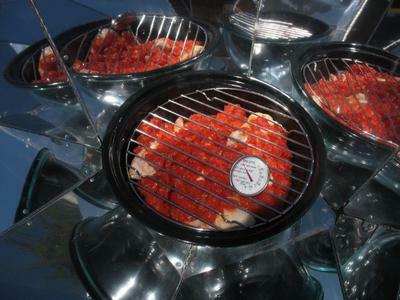 10:00 am—3 T. butter: cut in pieces and put in Hot Pot, cover, set up facing the sun, set timer for 30 minutes. 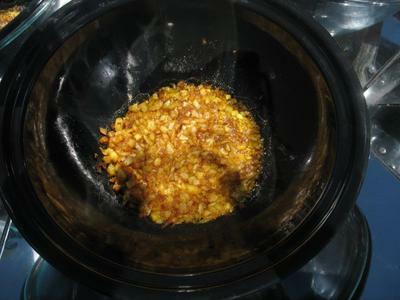 10:30 am—veggies and seasonings: quickly add to Hot Pot, quickly stir into butter, cover, set timer for 30 minutes. 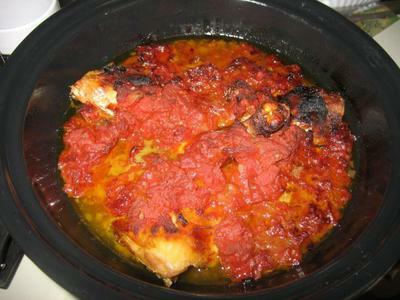 add, putting thickest pieces of chicken toward the outer edges of Pot and pouring tomatoes over chicken. Set round baking rack in top of cooker. Put thermometer in, touching food (do not insert into meat) and letting the baking rack ‘hold it up’ for easy reading later. Cover, adjust to sun, set timer for 90 minutes. 12:30 pm—check Hot Pot temperature by peeking through lid (don’t lift lid, just jiggle the Pot carefully to get the condensation off the inside of the lid). If temperature is at least 150, adjust to sun, set timer for 90 minutes. 2:00 pm—check Hot Pot temperature (especially on partly cloudy days)—must be above 150, adjust to sun, set timer for 90 minutes. 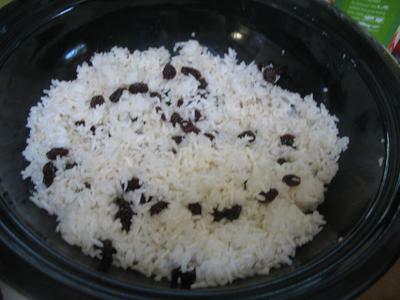 Also, if you have another Hot Pot, you can do the rice in it! Another solar cook mentioned cutting back on the ratio of water to rice, helping it cook quicker, so we’re going to try that! 2:45 pm—preheat another Hot Pot by covering and setting up facing the sun. 3:30 pm—check chicken Hot Pot temperature. If it is still above 150, then you are probably okay to do what we do—let it coast/cook more until 5:00, because we like a 5:00 suppertime better than 4:00. (smile) Adjust to sun, set timer for 90 minutes. When ready to eat, make sure chicken is fully cooked by pushing thermometer into the thickest part of the center piece of meat but not touching bone. It should read at least 165 degrees Fahrenheit. Serve over rice or pasta.